It is GREAT and I loved all of the 4 episodes. This documentary movie provided some great insights towards the problem and issues of current China. Chinese usually are very patriotic and not good in dealing with critics but it is important to understand about what is becoming of China and what we could do to improve things around the country. If there is a 5th episodes, I’d be very interested to see more of the major city life and people who live in Shanghai or Beijing, this could be mind blowing as well. In four episodes of about 55 minutes each, this PBS documentary examines some of the major challenges facing contemporary Chinese society. 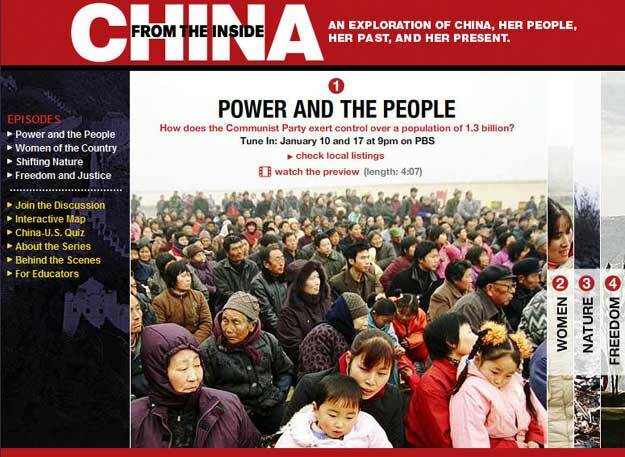 Episode 1, “Power and the People,” focuses on the Communist Party’s rule of China. Topics include government opposition to separatism in the heavily Muslim province of Xinjiang; the Party’s efforts to create a prosperous society; the governance of Tibet; the National People’s Congress, which puts the Party’s decisions into action; the election of a village committee; and corruption in the Party. Episode 2, “Women of the Country,” focuses on the difficulties faced by Chinese women, especially in rural areas (where two-thirds of China’s population lives). The episode examines birth planning, marriage, women who live in the country while their husbands work in the city, women in Tibet, the hopelessness of many young women in China, the Muslim women of Xinjiang, and the opportunities and hardships for women in cities. Episode 3, “Shifting Nature,” focuses on pollution brought on by rapid industrialization and on massive water diversion projects that involve resettling the populations of entire towns. Episode 4, “Freedom and Justice,” examines the limits on religious freedom and freedom of the press, AIDS deaths that the government could have prevented, the displacement of poor people by land “development,” and injustices in the justice system. This is an interesting, informative, and thought-provoking documentary.